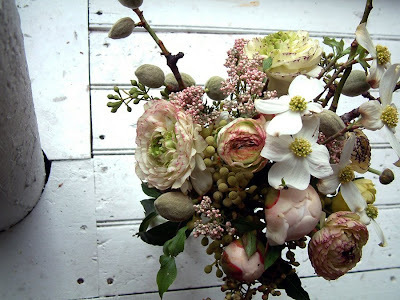 playing today with peonies, ranunculus and almonds on the branch. Also in there is langanoza, eucalyptus and dogwood. 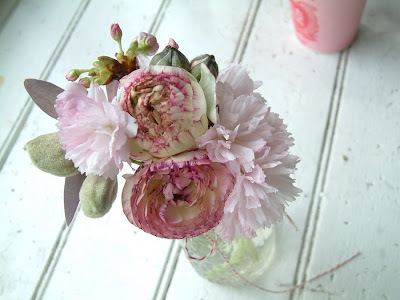 i love the peonies and almonds! oh my. love them both. What are the flowers in the top picture that look like clusters of tiny pink pearls? They're in the top left corner of the bouquet. that is gorgeous. Your arrangements are inspiring. So glad that peonies are coming in - my favorite flower. oh my - what beautiful arrangements! delicious! this shot should be a card. except i'd never send it!